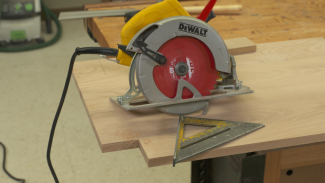 July 10, 2012 By Paul Mayer and Seth Keller & filed under Cabinetry, Plans and Projects, Woodworking Projects. 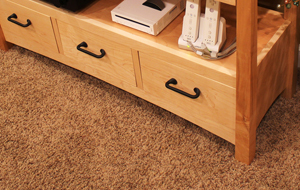 In need of a media cabinet to house electronics gear for a new home theater room, I went to Seth Keller (WWGOA Contributing Editor and professional designer) for design assistance. 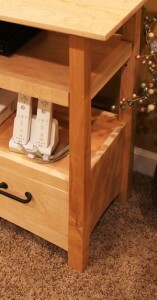 My requirements were to allow for a large flat panel TV to sit on top (although mine is currently mounted to the wall above the media cabinet), to house lots of gaming and AV electronic components with plenty of air flow to prevent overheating, and to provide easy access to the back of components for cable modifications. Oh, and my wife said it needed to look nice, too. 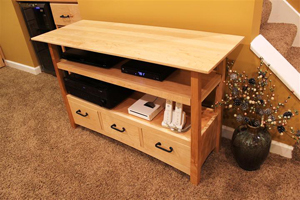 Within this plan you will find everything you need to build this media cabinet, including a cut list and measured drawings for all components. Diagram A: Master drawing of all components, labeled to match the cut list. Diagram B: Leg drawing, including size and placement for mortises and shelf pins. Diagram C: Drawer bank, exploded view. Diagram D: Shelf and edge band design. Diagram E: Drawer construction details. I love the look of tapered legs on furniture, and Seth decided to incorporate them in as a design element in this project. 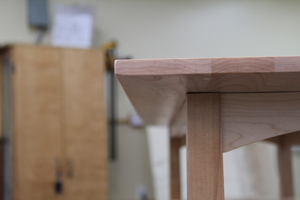 To simplify the process, he chose to only taper the outside surfaces of the posts, allowing all of the joinery connecting to the legs to be square. This adds a nice elegance to the piece and gives it a lighter appearance. The top of this piece is actually quite heavy as it is constructed of 7/8? thick hard maple, but the edges are chamfered to 1/2? thickness in a gentle taper that extends back 2-1/2? from the edge. 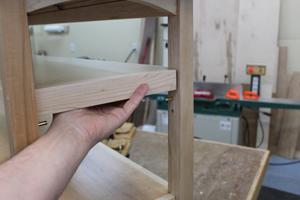 The shelf also has a recess milled through the edges so that the shelf pins are concealed behind the edge banding. This project incorporates solid wood for the top, posts and drawer fronts, and for stability, cost and ease of construction I have utilized a high quality veneer core plywood for the lower sides, shelves, and drawer bottoms. 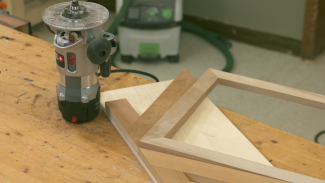 When using plywood for a fine furniture project, it is important to choose a high grade plywood with thick face veneer so that you do not sand through the veneer when flush sanding edge banding, and so that the grain looks pleasing and in unison with the hardwoods in the piece. The majority of the joints in this piece will be mortise and tenon. 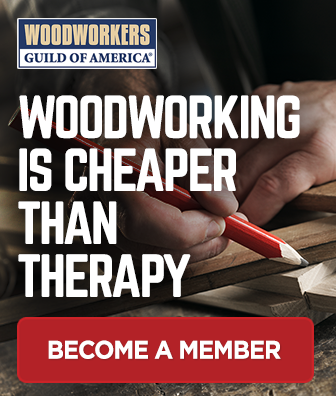 This is a traditional strong joint for joining end grain to long grain. 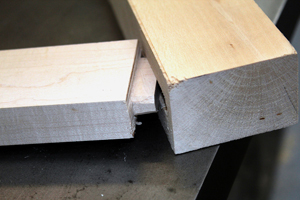 The mortise is the socket milled into the long grain on the receiving piece, and the tenon is the protrusion extending from the end grain of the rail. 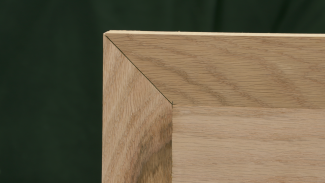 The walls of both the tenon and the mortise are referred to as ‘cheeks’, and the ledge formed at the base of the tenon are referred to as ‘shoulders’. The members of the lower carcase assembly will be joined with biscuits. Where is the Cut List for this plan? Hi Tom. All of the PDF’s for this are below the Part 1 paragraph. If you have any questions, please give our customer service team a call at 1-855-253-0822.